Laura Jane Addams was born in 1860 of a wealthy family in the northern Illinois town of Cedarville. She was the eighth of nine children, five of whom died in infancy. She was a toddler when her mother died, but her father, a prosperous miller and political leader with influential friends, including Abraham Lincoln, became her role model. A defect in her spine limited her physically, but she was driven to find her niche in life. 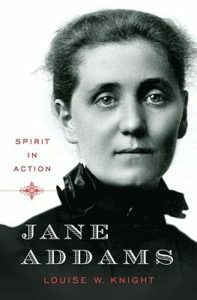 Jane graduated from Rockford Female Seminary in 1881 and a year later was granted a bachelor’s degree when the school became accredited as Rockford College for Women. She entered Women’s Medical College in Philadelphia but had an operation on her spine, which ended her medical education. The visit in 1887 to the settlement house at Toynbee House in London with her friend Ellen Gates Starr inspired the pair to establish Hull House in Chicago, the first settlement house in the U.S. This facility offered day care, kindergarten, educational classes, public kitchen, social programs and other assistance to those in need. It grew to include more than 10 buildings. In 1963 University of Illinois established its Chicago campus, which demolished the buildings except for the original Hull House, now a National Historic Landmark and museum. However, the Jane Addams College of Social Work is part of UIC. This social reformer had a heart attack in 1925 and never fully recovered. She died in Chicago on May 21, 1935 at the age of 74. Thank you for this inspiring post. I remember reading about Jane Addams in college. She’s one of the reasons I majored in Social Work.